Foot Locker could become a big beneficiary of the “rise of sneaker culture,” Jefferies Analyst Randal Konik writes. Nike‘s comeback should help support Foot Locker’s future earnings growth, Konik said. Shares of the shoe retailer dropped 13.84% on Friday after it reported disappointing quarterly earnings. 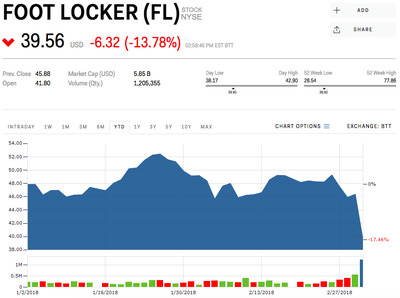 Watch Foot Locker’s stock price move in real time here. Sneakers have become in vogue again, especially among the lower income demographic, Jefferies analyst Randal Konik wrote in a note to clients. Foot Locker has seen a sizable number of cash transactions, which he said is common among the low income group. He believes that renewed interest will only continue to grow with improving employment and wage trends. Konik says this position has been solidified by the rise in popularity of Nike. Though Nike has had its own share of struggles while looking to gain an edge over its rivals, Foot Locker will be part of its strategy to curb its wholesale distribution in order to focus on key accounts, of which Foot Locker is one. This will potentially give the shoe retailer better access to the best Nike products, Konik said. Already, Nike’s VaporMax, VaporMax Plus, Air Max 270 and the Epic React, as well as its Jordan business, have all been popular with Foot Locker customers. Yet Foot Locker has hinted that it expects to receive better products from major brands in the near future. He added that he hopes to work with vendors like Nike and rival Adidas to increase the pace at which athletic footwear and apparel are brought to the market. “Our industry still does move too slow,” he said. Indeed, Nike has been criticised for moving slowly on trends, but its consistent release of new styles and colours for its popular VaporMax and VaporMax Plus has precipitated the sneaker company’s own comeback. And Nike’s inflection should eventually rub off on the shoe retailer. After all, Nike represents 70% of Foot Locker’s total products, Konik added. The analyst believes Foot Locker’s valuation is too low, which makes it an attractive buy. His price target for the company is $US55, which is 38% above its current share price. Foot Locker’s stock was trading at $US39.51 a share, and was down 17.46% for the year. Read more about how Nike is regaining its sneaker dominance from Adidas.